Beach Canvas Gold Laser Charm. Alaska. Here is a magnificently created canvas of the beach. 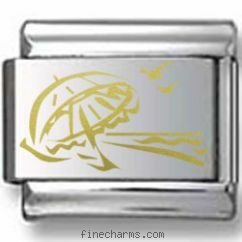 This charm is laser-etched onto a stainless steel base link, using a gold laser technology. Add this one to your collection.